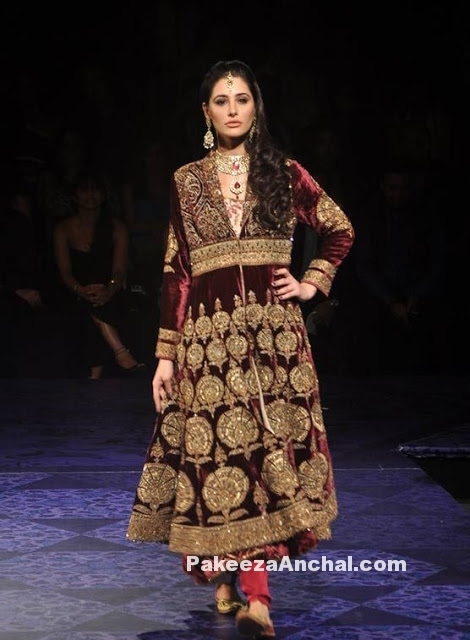 Rockstar fame Nargis Fakhri wearing a Bridal Long Velvet Kameez in Dark maroon Color embellished with full Gold Kashmiri work designed by JJ Valaya during the grand finale of India bridal fashion week. Long Velvet Kameez with Full Sleeves, paired with a red Silk Churidar and a matching Jooti made her looked like a perfect Bride. Along with the Super Attire a matching Necklace, Matha Patti and Jhoomkas were also seen on her.